Does drinking really kill brain cells? Does listening to Mozart make your baby smarter? For all the mileage we've gotten from our own brains, most of us have essentially no idea how they work. We're easily susceptible to myths (like the "fact" that we use only 10% of our brains) and misconceptions (like the ones perpetrated by most Hollywood movies), probably because we've never known where to turn for the truth. Fun and surprisingly engrossing, Welcome to Your Brain shows you how your brain works, and how you can make it work better. 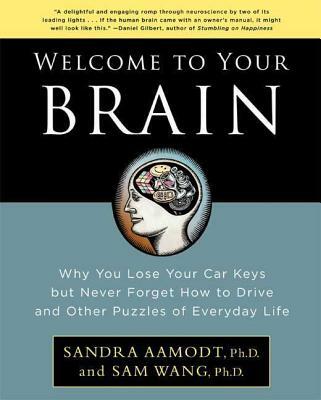 Sandra Aamodt, Ph.D., is the editor in chief of Nature Neuroscience, the leading scientific journal in the field of brain research. Before becoming an editor, she did her graduate work at the University of Rochester and was a postdoctoral researcher in neuroscience at Yale University. She lives in California with her husband, a professor of neuroscience. Sam Wang, Ph.D., is an associate professor of neuroscience at Princeton University. Before becoming a professor, he studied at Caltech, Stanford, and Bell Labs. He has published over forty articles on the brain in leading scientific journals and has received numerous awards. He and his wife, a physician, live in Princeton, New Jersey, with their daughter.